Founded in 1955, we are the premier, industry-leading specialty chemical manufacturer that delivers state-of-the-art, scalable, ready-made or customized chemical solutions with exceptional customer service and care. Our heritage includes such well-known companies as Union Carbide, Westinghouse, Oxychem, and Cognis. We proudly promote branded solutions that include Versamid® and Capcure® epoxy curing agents, Phenoxy resin, and Ranbar® alkyd resins. Gabriel was purchased by Audax Private Equity in 2014 and has since focused on expanding our product portfolio, manufacturing capabilities, and solution offerings to better serve over 1,000 customers around the world. 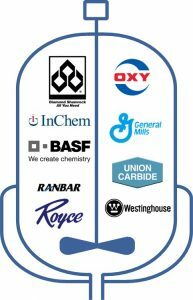 You distill down all these brands, technologies and chemistries and you have Gabriel – a company you can trust to do the right thing every time. We’re more than just a supplier, we’re your partner in finding the best solution for your needs. December 2015 – Gabriel acquires Versamid product line from BASF. January 2016 – Purchased the Phenoxy product line from Inchem Corporation; added our second manufacturing facility in Rock Hill, SC. November 2017 – Acquired Ranbar, based in Harrison City, PA. This becomes our third manufacturing site in North America. April 2018 – Acquire RoyOxy® (a division of Royce International). This adds over 300 products to our epoxy curing agent and specialty additives portfolio. May 2018 – Gabriel Zhuhai is chartered to promote our Versamid product line in China and the broader APAC region. October 2018 – Completes realignment of mercaptan Go-To-Market strategy. All mercaptan curing agents in North America are now sold directly through Gabriel, leveraging the RoyOxy warehouse network. The development of our product portfolio, manufacturing capabilities, and distribution model allows us to be a complete solution provider. Customers from all over the globe partner with Gabriel because of our commitment to providing the broadest array of solutions to the Coatings, Adhesives, and Composite markets. We are experts in providing products, formulations, and tailored solutions for our customers to help them maximize their growth potential and profitability. Gabriel’s Phenoxy™ PK™ has the broadest range and longest experience in phenoxy resin industry. Phenoxy™ PK has ductile, amorphous, thermoplastic polymers that contain excellent thermal stability, adhesive strength, flexibility, impact strength, and vapor barrier properties. Phenoxy™ resins may be crosslinked by reacting its hydroxyl functional groups with isocyanates, melamine resins, or phenolic resins. Crosslinked Phenoxy™ resins exhibit excellent chemical resistance, hardness, and adhesion on many substrates including steel, aluminum, glass, and carbon fibers, and plastics such as nylon and polyester (PET). Phenoxy™ PKHH may also be formulated in single-pack epoxies containing latent hardeners, such as dicyandiamide, providing improved toughness and adhesive strength on substrates when properly cured. Phenoxy™ PKHH is soluble in many polar, aprotic solvents such as MEK, cyclohexanone, and glycol ethers. RoyOxy™ is Gabriel’s industry-leading manufacturer of specialty epoxy resins, diluents, curing agents, and additives. The RoyOxy™ line has been supporting the coatings, adhesives, and composites industry since 1995. Customers in need of assistance when formulating come to RoyOxy™ to help them develop new products. With a varied product line, RoyOxy™ products serve many unique markets. Versamid® curing agents include reactive polyamide resins, amidoamines and modified amines designed for use with epoxy resins to provide tough, chemical-resistant, formulations that cure at room temperature. These materials are used in coatings and adhesive applications. Our Versamid products offer unique combinations of hardness and flexibility along with the highest chemical and solvent resistance of the polyamide resin series. Decades of experience safely manufacturing and handling challenging raw materials and chemicals has put us far ahead of the curve for environmental compliance. Our nationally recognized Environmental, Health, and Safety and Quality (EHS&Q) programs include a powerful Integrated Management System (IMS) that allows us to effectively control our environmental footprint. Gabriel’s Integrated Management Systems is certified by Amplus Global Associates (formerly CCAS Americas company), that covers the organization’s three highest standards: ISO 9001: 2015, ISO 14000:2015, and ISO 18000:2007. Our corporate culture is constantly seeking opportunities that are innovative, safe, and responsible. Our Ashtabula, Ohio facility participates in the ChemStewards® program through the Society of Chemical Manufacturers and Affiliates (SOCMA) further certifying our commitment to all of our stakeholders. With superior EHS&Q measures in the plant and on-site, plus advanced facilities and equipment, we can safely and efficiently handle bulk raw materials and hazardous materials. Everyone associated with Gabriel—whether management, employees or contractors—is responsible for operating in the most environmentally and socially responsible manner. We manufacture our products to make the biggest impact in the markets we serve, while also leaving the smallest footprint on our planet. Products such as Ranbar® use low-cost water reducible technology and high solids VOC compliant resins to create greener solvents. Also, everything from labor, materials, and our manufacturing processes are analyzed for ways to increase customer efficiency and minimize waste. Gabriel’s “Operation Safety Cares” initiative revolves around 5 pillars: Community. Accountability. Responsibility. Emphasis. And Safety. Each one has specific goals that either meet or exceed our stakeholder’s requirements and specifications. Acquisitions are a vital part of the Gabriel strategy. We are open to discussions with reputable companies that are profitable and growth-oriented. While our primary focus is in solutions for the Coatings, Adhesives, and Composites markets, we are most interested in well-managed companies who accelerate their growth by leveraging Gabriel’s expertise and market presence. Contact Seth Tomasch (CEO) for a confidential discussion (330) 517-2382.